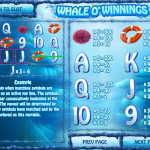 Whale O’Winnings is a 5 reels 50 paylines slot game released in 2014 by Rival. You might already suspect to spot one of those way too big ocean creatures and you’d be right! This game takes place underwater and hosts a very nice bunch of marine creatures. The Wild in this game is the Smiling Whale symbol which will substitute other symbol to create a winning combination. 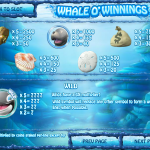 It also comes with a 3x multiplier for your wins and a 7777x of your bet when you get 5 whales alone! There is one scatter in this game which is a bit disappointing and it is the Dolphin symbol. Landing 3, 4 or 5 anywhere on the reels will reward you with 10, 15 or 50 Free Spins respectively. The multiplier for those wins is 2x with a chance to re-trigger the Free Spins when landing more scatters. 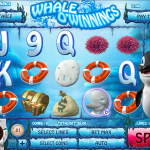 Whale O’Winnings is a great looking game that is both fun and engaging. It is a bit disappointing however when it comes to the bonus features. We just expected more. The RTP here is 95%. If you’re looking for a game taking place above ground then you should consider playing Western Wilderness a 5 reel slot by Rival.